Mel Cooper is a Newfoundlander by birth…and claims this might account for his early move into broadcasting and for a sense of humour which has helped make him one of Canada’s most popular convention and conference speakers. Mel was raised on Signal Hill in the shadow of Cabot Tower where Marconi received the first radio signal. He moved with his family to Vancouver to complete his schooling at Vancouver College and at the University of British Columbia. In 1951, he began a radio career as an announcer and journalist that blossomed quickly into senior management positions. As a Vice-President of Western Broadcasting and General Manager of CKNW in Vancouver, he developed a country-wide reputation for innovation, leadership and creativity. Mel concluded a 52-year radio career with the sale of C-FAX and CHBE-FM in Victoria. In 1985, Mel agreed to donate his full-time services to the EXPO ’86 Corporation. As Vice-President he headed a division that was responsible for raising $171 million in corporate support, a World’s Fair record. He was a key member of the Canadian Bid Committee that won the 1994 Commonwealth Games for Victoria and was chairman of the Board of Governors of this major international event. For these and other contributions, the Province of B.C. named him an “Ambassador of Tourism,” and in 1992, awarded him The Order of British Columbia. Junior Achievement recognized his considerable contributions by naming him the Victoria “Enterpriser of Excellence.” The Variety Club of B.C. gave him its highest award, the “Golden Heart.” He’s also been honoured as the Victoria “Business Person of the Year” and has received two lifetime awards, for leadership and achievement. In 1989, he received the ultimate honour when he was named a Member of the Order of Canada. Mel also has had varied business involvements. He was one of the founders of Air BC and chaired the airline for 20 years. 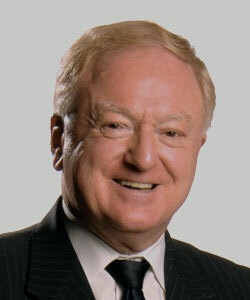 He served for 15 years as a director of the TELUS Corporation and 10 years on the Board of the Royal Bank of Canada. He is currently chair of the TELUS Victoria Community Board.